Anything and everything related to bloggers and blogging. Why am I on this? – Messaging Power App Telegram releases Telegraph – the quickest way to share your thoughts online. Well I saw Telegram came up with something like a blogging platform of sorts, a la Medium.. and being the huge Telegram fan and user that I am, I felt compelled to check this out and so here I am typing on my iPad with no particular topic in mind except for getting this over with so I can see what it is and how it’ll look like when I finally hit “Publish” because right now, all I see is white space everywhere and considering how cluttered the Internet has become over the years, this is both refreshing and weird for me. So hold on, let me take a screenshot so you could see what I mean. Screenshot of my iPad screen as I was typing this post. Whoa. So meta. Like OMG is this for real? 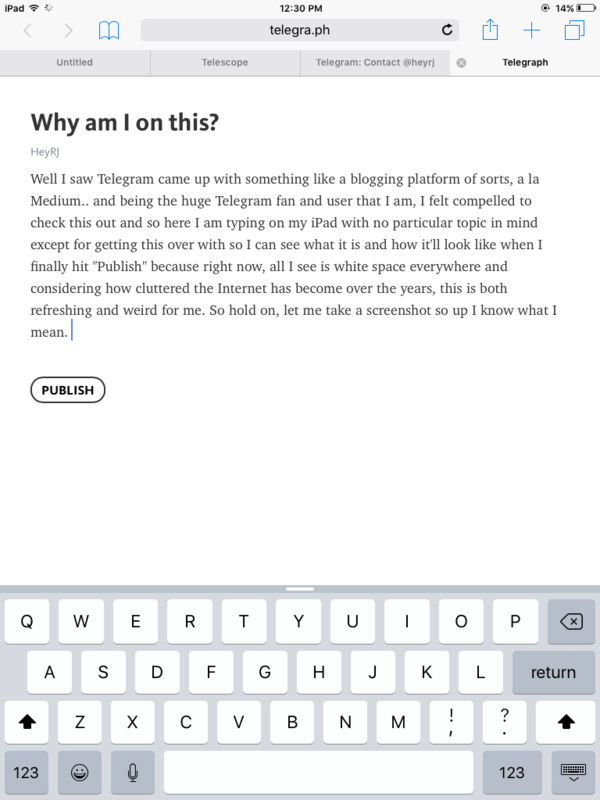 Absolutely undistracted blogging UI that only gives you exactly what you need as you need it. That is so simple yet so profound, so much so that I’m actually surprised that I’m still writing up to this point when I told myself from the beginning that I was only going to type a sentence or two. Like wow. I could get used to this. I haven’t been blogging personally for so long because over time, it seemed to me that it’s become too much work composing your thoughts, adding pictures, worrying about SEO and sh*t that I end up not writing altogether. This is really nice. I think I just found myself a new platform for daily diary entries. Let’s see what happens in the coming days. I feel excited and you should too. Today, January 1. 2017 — I commit to blogging consistently daily for 365 days. So let it be blogged, so let it be done.